Windows 98, Me, 2000, 2003, 2008, XP, Vista, Windows 7, 8, 8.1 and Windows 10 (32+64 Bit). This is per client possible ! From Version 14.3.05 per language + client ! The key [Print] prints out the current screen. The key [Alt+Print] prints out the current window. A click onto the Hardcopy - symbol in the System Tray prints out the current screen. 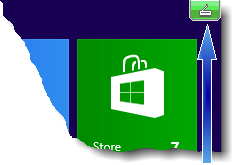 A click (with the left mouse button) onto this icon prints out the current window. 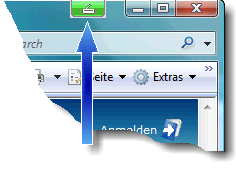 A click (with the middle mouse button) onto this icon enables as example a partial window. A click (with the right mouse button) onto this icon enables as example a copy to WinWord. You can set any function to any key or symbol. The used graphics functions are licensed! You can store the window content in different file formats. You can print up to 20 Hardcopys onto one page (also time-controlled). You can reflect the window content with vertical or horizontal mirrors. You can rotate the window content to the left or to the right after. You can extend the window content or reduce the window content. You can edit the window content with another graphics program. You can insert one or more mouse pointers. You can adjust, whether a page count, Date + Time, PC name, or the user name is printed. You can adjust, whether you want to align the printout vertically or horizontally. You can set the margins. You can printout into monochrome (monochrome) or in gray levels. You can adjust to use the standard printer or another printer. You can create all nth seconds one Hardcopy. They can put in a file all nth seconds in Hardcopy. Hardcopy offers the possibility to you, to print or save the current window or screen, whether you work with SAP R/3® or with any other program ! You can printout in landscape format (also automatic, dependent on the size). You can determine the margins. You can print out in monochrome. You can make this dependent on the pressed key. You can use Hardcopy with all Windows systems! Every screen / every window can be send by E-Mail. An image can be inserted directly to WinWord/Excel. The offered software is freeware, only a tip is expected ! This is a service from share*it! - Digital River. This is the freeware version! Please use the known download address.